North Norfolk Holiday Cottages are top of the list but we have so many other places that are super dog friendly too. North Norfolk is renowned for being dog friendly and it’s why so many people holiday here with their four legged friends. It’s so dog friendly we even have our very own online magazine called The Barking Bugle that celebrates all things doggy in the county. We have great pubs, fabulous days out, amazing beaches and so much more. Nearly all beaches in North Norfolk are dog friendly with very few restrictions. My favourites are Brancaster, Holkham and Wells. But the dog walking options don’t stop there, why not do a bit of coastal path (we have miles of it) and have lunch in a pub before returning home on the coast hopper bus to reheat in front of one of our real fires or head slightly inland to Brancaster Common or one of our fabulous country estates, both Holkham and Sandringham are dog friendly. For a detailed list of dog friendly beaches check out Explore Norfolk’s guide. All of our pubs are dog friendly, our favourite is Jolly Sailors in Brancaster Staithe, they actively encourage muddy dogs and their bar staff can often be found giving lots of love (and chicken) to your dog. My little spaniel, Oreo, adores them all and knows to wag excitedly at all the blue t’shirted staff! I actually can’t think of a pub that isn’t Dog Friendly, some have restrictions in their restaurants, so it’s always worth checking when booking a table. A fairly comprehensive list of local pubs can be found here. Surprisingly Brancaster Golf Course welcomes dogs and they don’t even have to be on leads, the location is amazing and often the tide can be a extra obstacle, it’s worth checking tide times as the golf club road can become inaccessible, along with parking. You can also take your dog on a Bean’s seal trip, November to February are great months to see the seal pups, dogs are welcome to come along too, but are asked to remain on leads. Or how about taking to a bit of island living, beautiful Scolt Head island can be accessed from Burnham Overy Staithe by the Island Ferry which leaves from the harbour about an hour before high tide and runs till about an hour after and dogs are welcome aboard. 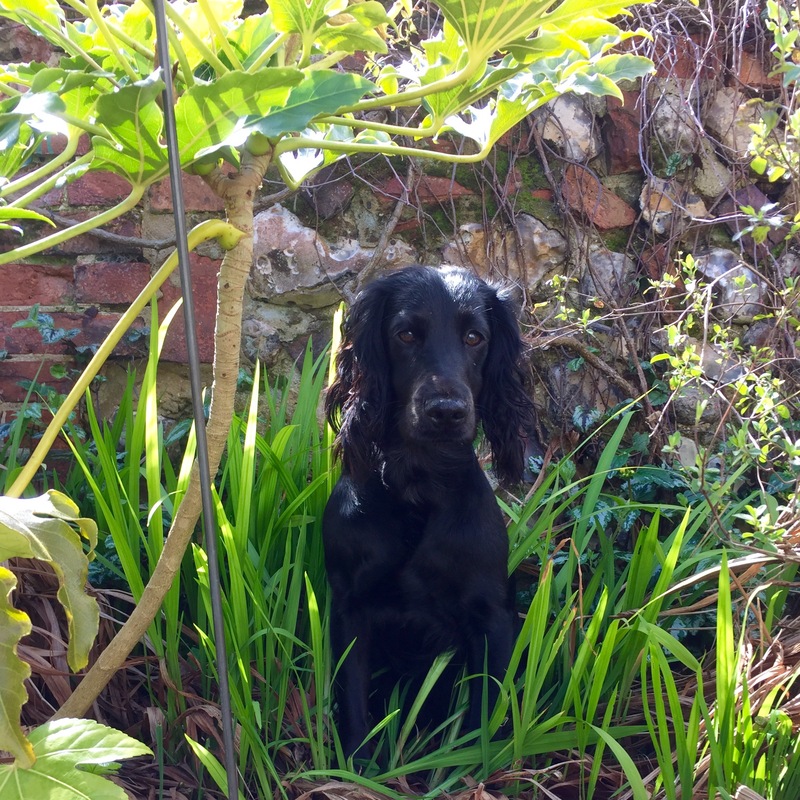 All our cottages are dog-friendly and if you'd like to go out for a while we will happily lend you a dog crate or if you'd prefer we can help find you a local dog sitter. We provide dog towels, dog bowls and, our very popular, 'holiday dog' name tags. Please ask us for the number of dogs we are willing to accept, it really depends on the sizes and also the number of humans they are bringing with them. Our only concern is your comfort in the property. We never charge for dogs to stay at our properties. 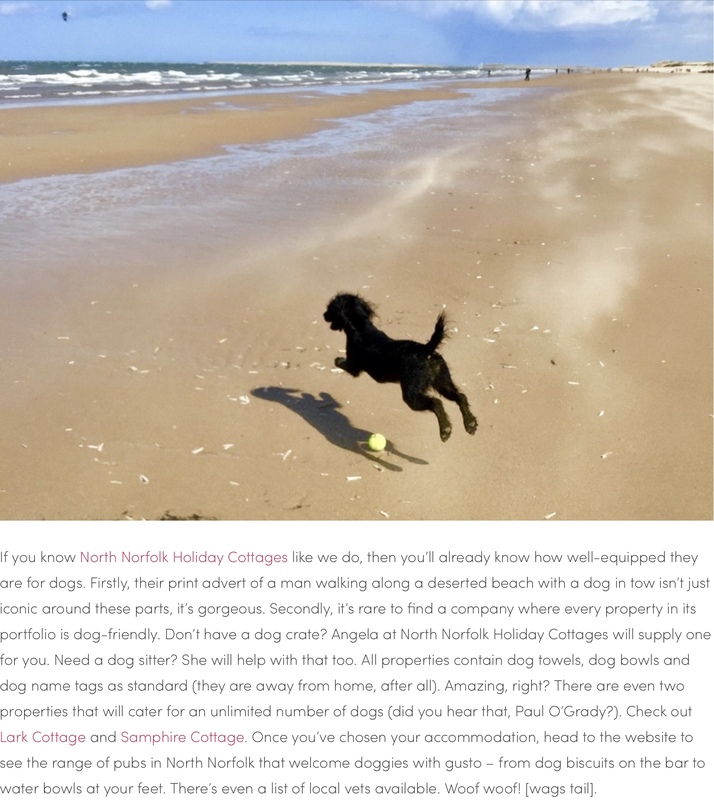 Wonderful Muddy Stillettos recently recommended our cottages in their Dog Friendly Issue, here’s the link if you’d like to read what they had to say, one of just two companies in Norfolk. Book Now! Fantastic article, thank you for posting such excellent dog friendly information.